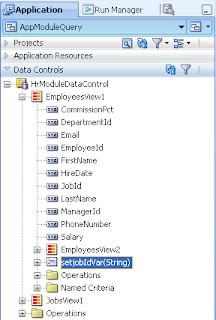 Often we need to define and invoke View Object filtering. 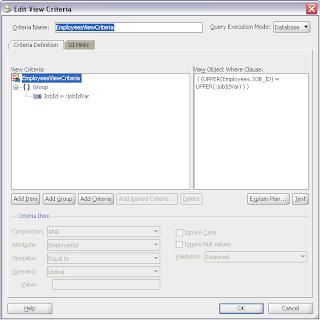 In ADF 11g we can do this by adding WHERE clause to View Object SQL statement or by defining View Criteria and invoking it later. I prefer second approach, why I should play with SQL statement, if ADF 11g can generate it for me. Okej, when there is View Criteria, it should be invoked. There are different approaches to do this - from declarative to programmatic. Today I will describe my preferred approach, I'm not saying you should use it as well. the only part I don't agree to is calling executeQuery each time the setter of the bind variable is called. While this is suitable if you only have one variable it is not wise to do so if your criteria has i.e. three variables. This would cause three executions of the query. In this case I expose a method in the application module or the VO and call this. I agree with you, but its how it works currently. 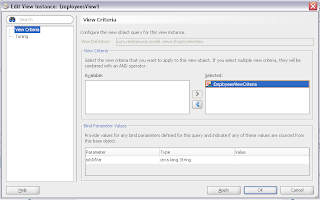 I am getting a class cast exception message when I am using my view criteria for "ADF Query panel with table". 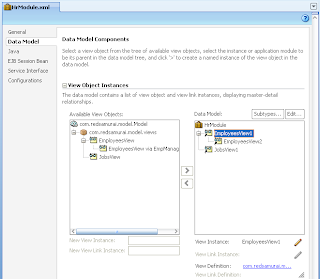 What the heck is ensureVariableManager???? Anonymous, where you see the heck? :) You can search for ensureVariableManager, its easy. 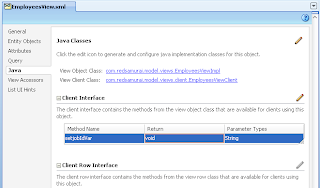 Look into EmployeesViewImpl.java available in Model project. Ok, I didn't realize that ensureVariableManager is an inherited method! Ok, so this is pretty cool. How would you recommend doing this when calling it from a autoSuggestBehavior tag? This is different. Here we just enforce VO instance to be filtered always. Could you please tell me how to pass a list as bind variable. If suppose in the below query I need to give the three values from Bind Variable. Based on your post i have created two named criterias for my view. One is for Search By Id and the other is for Search By Date. I want the View query to be executed based on: first named criteria if Id is not null and second named criteria if Date is not null but, not both at a time. So, how and where are we deciding which named criteria to be executed? I am trying a similar task, Could you please guide. I tried this scenario in my system, But i'm getting this exception..
oracle.jbo.SQLStmtException: JBO-29114 ADFContext is not setup to process messages for this exception. I can't see why would this not work. Your error message is too generic. What is way out, if I don't want to apply the same view criteria everytime I run the VO. Is it possible to declaratively add this specific view criteria only when I need it?